Watch the teaser trailer for their upcoming theatrical release "Gnome Alone," an adorable and funny animated family feature debuting in theaters everywhere October 13. 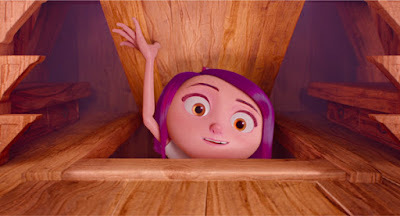 "Gnome Alone" is an energetic animated movie about one girl’s journey to discover the hero within herself and the home she’s always wanted. After moving to a new city with her mother, Chloe (Becky G) once again finds herself in new settings that feel all too familiar. A new house that creaks, a new school with creeps, and mysterious garden gnomes that are kind of freaky dominate her first day. No sooner has Chloe tried to make her way, but aliens from another dimension descend upon her house and threaten the whole world. To top it all off, the gnomes in her house (led by funnyman George Lopez) come to life. Now, the only thing standing between Chloe and the end of life as we know it are her new gnome-tastic friends, her neighbor Liam (Josh Peck) and the strength within. It’s up to Chloe to become the champion girl she’s always been inside, and in the process discover that no matter where you are, you’re never "GNOME ALONE."